This was my first talk on configuration management, showing the benefits of a file-defined deployment pipelines – e.g. a Jenkinsfile with the „Jenkins 2“ CI Server. 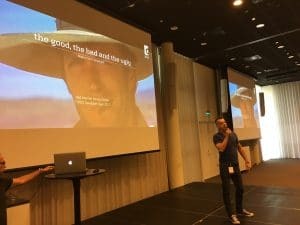 On this talk i had stressed the importance of ‚Code Reviews‘ as an essential technique to improve code quality, foster communication across team members and share knowledge. I kept going with a showcase of Phabricator, a suite of software development collaboration tools. Mostly used at dkd for doing Code Reviews and Source Control Management. Was the third talk completed the DevOps-Trilogy. I covered a couple of anti-patterns which are indicators that your deployment workflow could be done better. After summarizing Agile Commandments and well proven Best Practises I gave a short roundup of the most popular CI application stacks and deployment tools, like dkd’s open source solution. The talk finally and most importantly covered the different strategies required when your deployment target resides on a physical host or somewhere in a cloud infrastructure.